Assessing management practices of interest to producers in North Dakota is a primary objective of the SHARE farm. Producers expressed interest in the effects of tiling on both soil health and other components of the agricultural system (yields, weeds, pests, pathogens, economics). 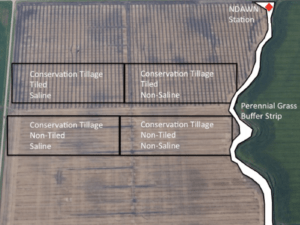 Action: We installed tile drainage on 80 acres of the SHARE farm in the fall of 2014 to be used in comparison with the same treatments on 80 acres of non-tiled field. Producers were interested in conservation tillage practices in the Red River Valley. Producers want to know how effective different tillage approaches are over tiled and non-tiled field and also for salinity management. Action: To evaluate conservation tillage effectiveness on tiled versus un-tiled and saline versus non-saline soil, we installed full scale strip till with shank, strip till with coulter, vertical till and chisel plow plots. NDAWN Station: Placement of an NDAWN station on-site improves our interpretations of research conducted on-site and recommendations for management practices. Action: we installed an NDAWN station in the summer of 2015 to get on-site climatological data and soil moisture with depth.